(Nanowerk News) First developed in China in about the year A.D. 150, paper has many uses, the most common being for writing and printing upon. Indeed, the development and spread of civilization owes much to paper's use as writing material. Such waste of paper (and ink cartridges)--not to mention the accompanying environmental problems such as deforestation and chemical pollution to air, water and land--could be curtailed if the paper were "rewritable," that is, capable of being written on and erased multiple times. 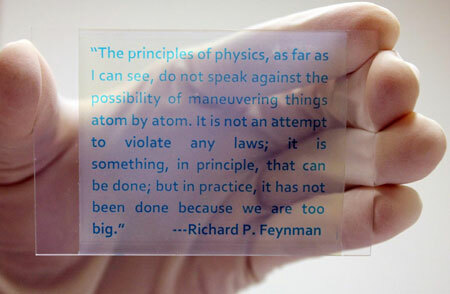 "This rewritable paper does not require additional inks for printing, making it both economically and environmentally viable," said Yadong Yin, a professor of chemistry, whose lab led the research. "It represents an attractive alternative to regular paper in meeting the increasing global needs for sustainability and environmental conservation." Study results appear online today in Nature Communications ("Photocatalytic colour switching of redox dyes for ink-free light-printable rewritable paper"). The paper comes in three primary colors: blue, red and green, produced by using the commercial redox dyes methylene blue, neutral red and acid green, respectively. Included in the dye are titania nanocrystals (these serve as catalysts) and the thickening agent hydrogen cellulose (HEC). The combination of the dye, catalysts and HEC lends high reversibility and repeatability to the film. "The printed letters remain legible with high resolution at ambient conditions for more than three days - long enough for practical applications such as reading newspapers," Yin said. "Better still, our rewritable paper is simple to make, has low production cost, low toxicity and low energy consumption." "Even for this kind of paper, heating to 115 C poses no problem," Yin said. "In conventional laser printers, paper is already heated to 200 C in order to get toner particles to bond to the paper surface." "One way is to develop new photocatalyst nanoparticles that become highly reductive when irradiated by ultraviolet light," Yin said. "We are exploring, too, the possibility of multi-color printing. The design principle can be extended to various commercial redox dyes to produce rewritable paper capable of showing prints of different colors. All these efforts will help increase the practical applications of the technology."